The parliamentary All Party Writers Group (APWG) has three aims. The first of them is "To represent the interests of all writers". That is probably impossible, because it assumes the interests of all writers are aligned. You only have to take an issue such as DRM to find that authors differ wildly in their opinions. Some panic and call for more DRM due to a worry about piracy; others (including many famous authors) take the opposite approach because they realise DRM doesn't prevent piracy, it just causes problems for their fans. Dealing with a plurality of views is difficult. That is why organisations such as the APWG lend more of an ear to lobbying organisations who also claim to represent authors' interests, such as the Authors’ Licensing and Collecting Society (ALCS) and Society of Authors (SoA). Who influences the APWG, and who do they listen to most? Easy to see. 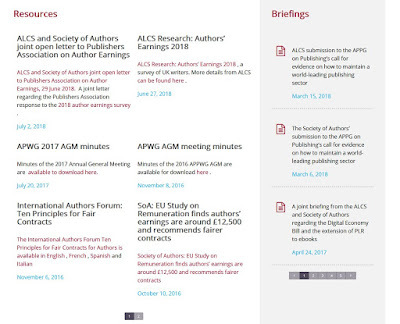 The first page of the APWG's Resources & Briefings has nine entries: four are via the ALCS, four via the SoA, all featured on the APWG page. It's possibly a bit like a Governmental body connected to farming mostly including material from the animal agriculture industry, and sidelining material from organic vegetable growers. On top of which, the APWG's "What is the All Party Writers Group?" 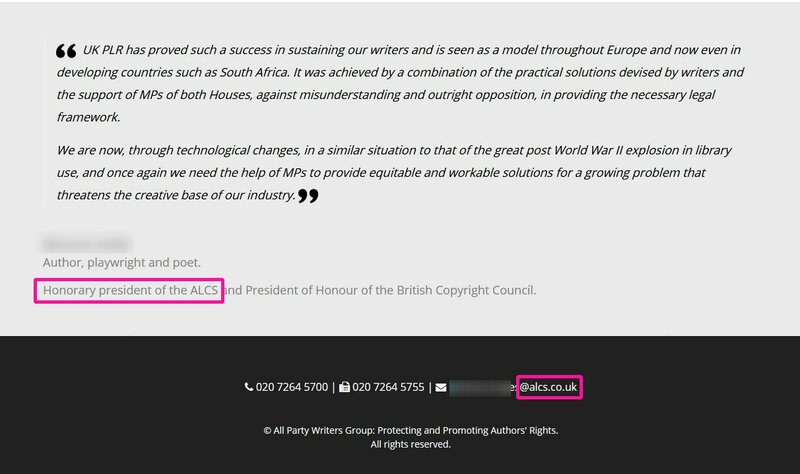 page ends in a feature quote connected to the ALCS, and the contact email address for the APWG ends in ... @alcs.co.uk too. It gives the impression that the APWG is just a mouthpiece for that organisation. But of course, the SoA and ALCS don't represent all authors' views either. In fact, authors that disagree with them on their stances on some topics inevitably won't be members, and their voices won't be represented by the SoA and ALCS. Masses of authors also aren't members because of a myriad of other reasons, such as not seeing the organisations as relevant (particularly as their models and histories evolved out of the old paradigm of trade publishing), or not being eligible, or through not having heard of the organisations. So the SoA and ALCS can only say with truth that they represent a percentage of authors - their members - and even then, some of the members may disagree with their official stance on some subjects. All professions are made up of individuals who will have differing views on the major topics of relevance. My previous career in librarianship was exactly the same, where organisations such as the Chartered Institute of Library and Information Professionals (CILIP) would claim to represent all librarians, when a majority of staff working in libraries were actually not members of CILIP, and often disagreed with CILIP's stance on certain topics. Although I worked with CILIP and its staff on many occasions, I achieved my professional accreditations from other sources. I don't mean this as an attack on the SoA and so on - they definitely do good work too - just on the stance that it is possible for anyone or any organisation to properly represent the views of a profession. The loudest voices are often just the ones with the most resources, but it doesn't mean they represent everyone. So what does this author think? I am a full-time author and fiction editor. All my income is from those two related roles. I've had Amazon Bestseller status; have chaired judging panels for international writing competitions; and am heavily involved in my profession via my networks with other authors, and some of the professional organisations I am an author member of. But I am not a member of the SoA or ALCS because they don't represent my views on issues such as copyright, DRM, licensing etc. Here are some of my thoughts summarised from previous posts. Licensing And Collecting Societies - I don't agree with these societies in general, which includes the ALCS, and state some of my reasons in that post. They don't represent authors such as myself. In particular, I find the ALCS business model to be dubious. I would rather the law made more exceptions to copyright so people can do more with a work, doing away with all that admin and sampling and licensing and staff time. 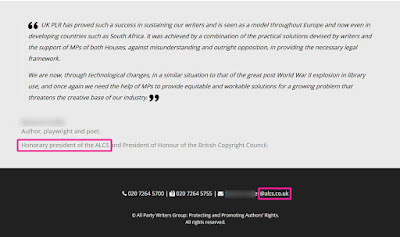 Copyright Restrictions On Books - some more about the ALCS/CLA, including why I could not actually join ALCS without compromising on my authorial principles. It also illustrates how clunky and misleading the CLA licenses and partial exclusions are. E-book lending and libraries - an example where the SoA's views were completely at odds with mine and many other authors, particularly in their apparent desire to implement or increase DRM in e-books. It's kind of funny because I am in a number of networks with fellow authors. A common complaint (and vast number of queries) are to do with the restrictions they are under - problems with quoting lyrics, worries about quoting titles, or using trademarked terms, or real places and businesses. Restrictions impact on creative arts. And yet those same restrictions rarely benefit the authors in turn, because only rich and big companies have the money to be able to enforce a lot of that stuff without a massive and costly battle (or even understand some of the complexities of it as international law). It's part of the reason I think we should make things more open, not campaign the other way like big music and film media conglomerates do. Openness benefits creative people and industries too. I have a Classics background. I studied great works of art, drama, poetry and so on, where the ancient creators built on and retold myths and stories in a way that couldn't take place nowadays because of the restrictions in place. We have corporations like Disney who are rich enough to get laws changed in their favour; then they take stories from the public domain, then trademark and copyright them to the hilt, and finally clamp down on anyone telling the story of Sleeping Beauty or Aladdin in any way that resembles the Disney interpretations (which most retellings would, because they are based on the same source material) - so most creatives self-censor, and back away as part of their risk management. We end up with corporations owning chunks of story and names that used to be part of the public domain. Likewise in novels set in the real world, authors back away from some of the contemporary names and references, they can't risk offending rich companies, and if the brands are mentioned then the author can never do it in a negative light, even if the scene is based on news stories and evidence. So again, they self-censor. Creatives should campaign for more openness and fewer restrictions, not the other way round. As the outrage over authors attempting to use trademarks shows (new cases over the last few days, but going back to Cockygate), authors are generally against anything that might limit their creations. World Intellectual Property Day - some general thoughts and reiterations of the above. There's bound to be other topics connected to creative industries where I don't agree with the stances or approaches of organisations such as the ALCS and SoA. This post was prompted by an All Party Writers Group call for evidence that came about because "ALCS has just released some research that suggests that the median earnings of writers has decreased since 2005" (the median is just one way of calculating an average - the mean may be a more accurate calculation). Basically, some authors' incomes have gone up, some down. None of which surprises me. In fact, it makes sense, because the whole landscape of publishing has changed, particularly in the last eight years. And it doesn't require much research to understand the reasons and the effects. A table from Our World In Data. 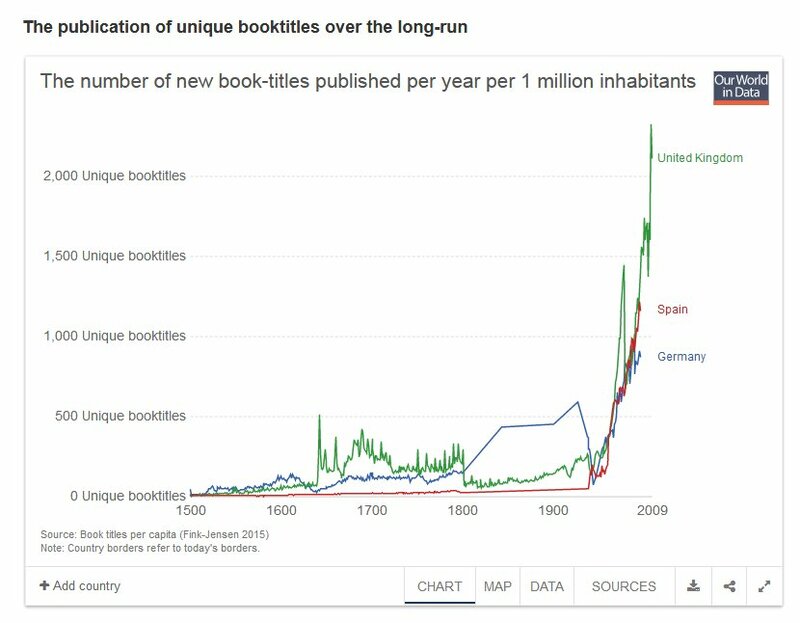 Note the massive and accelerating growth in the number of books published in the UK. And in many ways it is a vast understatement of the reality, because: it only goes up to 2010, but the growth rate has continued and accelerated since then; it doesn't include independently-published books, which may match or outnumber trade-published in volume; and it is only focussed on a few countries, but since we see the same pattern in the US and elsewhere, and those books are available globally (at least electronically), the number published per year needs increasing massively to capture the scale of global publishing. Even back in 2009 publishers knew that the number of books published was tripling every few years, while sales were going down. So we have more writers now than ever before, and more books being published, all targeting the same market (which grows, but not by as much). It may be even more noticeable here, since "the UK publishes more books per capita than any other country" (and that specifically excluded independent authors, where the largest growth lay). As that Guardian article showed, those in the publishing industry had wildly different opinions (and note how it reaffirms what I pointed out earlier - in any industry there is no single viewpoint, and anyone who claims to represent all people [in that industry] is being disingenuous at best). In that article one publisher said “I think we publish too many books, and I think this impacts negatively on how well we publish books as an industry. It is very easy to acquire a book. Much harder to publish it successfully. Less is so often much much more.” Too many books. Then a literary agent said the figure is “either a sign of cultural vitality or publishing suicide ... Of course, it is utter madness to publish so many books when the average person reads between one and five books a year." That article hit the nail on the head in identifying a potential problem. Too many authors and too many books; sales drop as a result. We saw a concrete example of that recently when the poor sales of titles chosen for Wales Book Of The Year were revealed. Publishers in Wales have been up in arms about the revelations, but hiding the truth is actually making things worse, and misleading people. If a nation's "best books of the year" are often ones that sold fewer than a 100 copies (see also this piece) then either the books aren't that good in the ultimate judge's eyes (the reading public), or there are so many books that only the best books sell many copies. But maybe this is a good thing. Maybe nowadays publishers can't rely on scarcity to sell books, or awards based on what a number of insiders think, but only on quality and demand. Personally I have issues with how much of the Welsh book industry is propped up by subsidies to make up for poor sales. If certain books can't survive without subsidies and awards then perhaps they shouldn't be printed, because there just isn't the demand for them. I always find the trade publishing perspectives on things to be so much more protectionist and subsidy-seeking than the rise of independent publishing, which is focussed much more on making books sink or swim on their own merits (partly because the authors are specifically excluded from such subsidies, and often even from prizes). It created a more independent mindset, and maybe that's what is needed more widely. Though, of course, the other issue affecting authors that go down the trade publishing route is poor royalties. They may receive 7-10% royalties on print books, up to 25% on e-books (whereas independent publishers can receive up to 70% royalties) - if author incomes go down for trade-published authors then a significant portion of the blame could be placed on that 60% royalty difference. That's a hit on the author, not the publisher - which is why the publishers are often happy with more books being out there, because they get their cut no matter what. Back to "Too many authors and too many books". So the average income from writing is going to fall. You can still make a huge amount of money if you are successful; though if you're not a celebrity, it takes more books, and generally can't be your sole income. The averages are skewed by books that don't sell, and poor books. If you get into a field with so much competition then it is just common sense that there is less money to go round. And that doesn't require action, it's just the way it is. 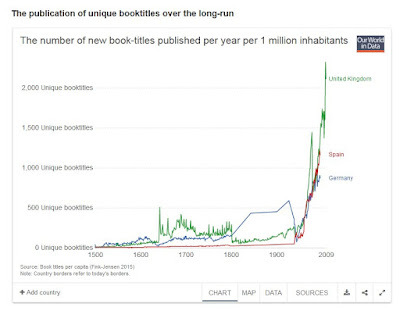 Unless authors publish fewer books (unlikely to happen) it is inevitable. So some authors earn less, but when a market is as saturated with products as the book market, average incomes will decline. The end result if that continues is that some authors will drop out, and some new authors will be put off writing for profit, and it will begin to balance out again. Authors are no different from other industries that deal with supply and demand in that respect, and I can't see that tweaking the periphery of this problem would do anything other than actually contribute to that root problem. I've answered many of their concerns regarding the call for evidence above. I don't think we need to "improve the position of authors through legislation and regulation". As the situation in Wales has shown, it just leads to money funding the publication (and eventual pulping) of unsuccessful books. The main problems that lead to lowering of authors' incomes are too many books (market is saturated), and often poor royalties on each sale (mainly affects trade-published authors - independent authors recoup greater royalties, though have more up-front expenses in hiring publication teams). It could be a possibility to look at the royalties issue, though there would be such huge resistance from the publishing industry that it wouldn't get anywhere. However, if the APWG really wanted to help authors, there may be another way, which I'll get to soon. 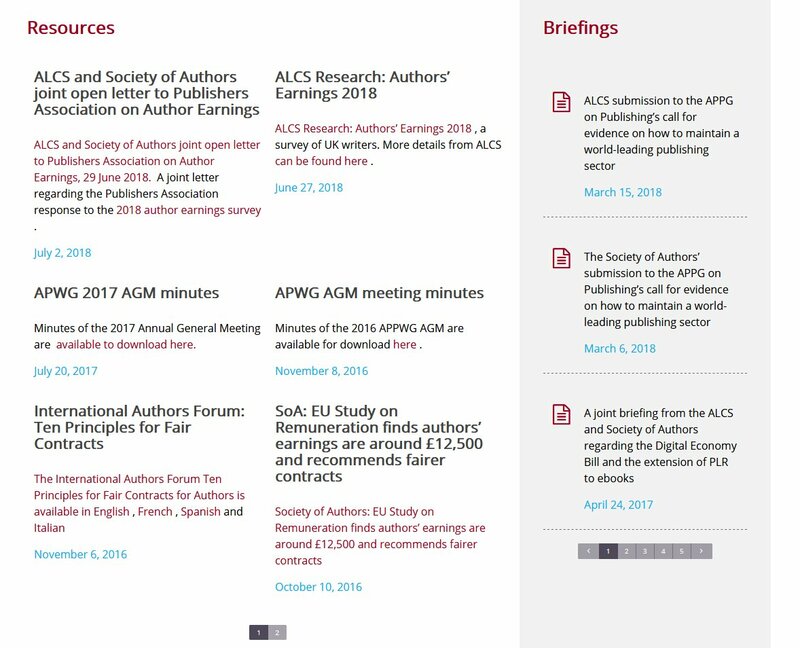 The APWG also want to know about "The Impact of Brexit on writers and copyright, how past and developing EU law and regulations have affected authors’ earnings and how this might change." This is easy to check. 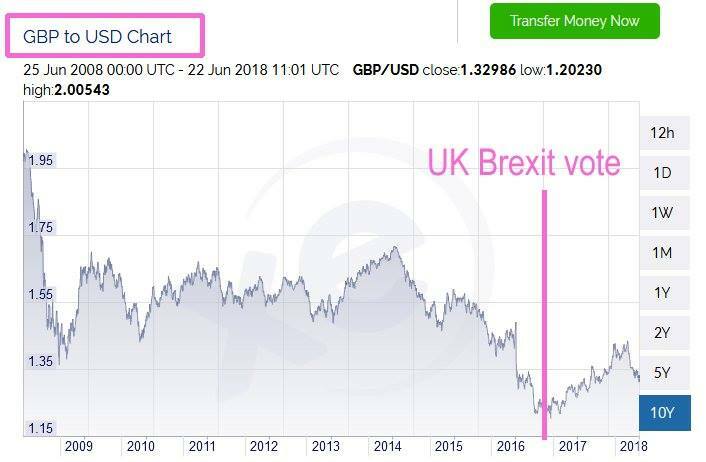 Since the flawed Brexit vote we have seen a massive drop in the spending power of £GBP. Here is a chart I generated last month showing the GBP to Euro conversion rate. 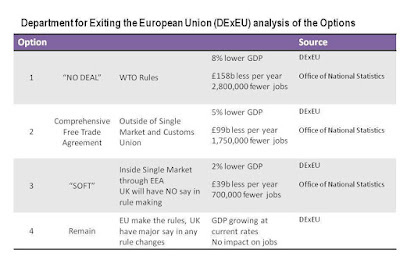 Where it began to fall in 2015 is the point when Brexit discussions about having a referendum began. 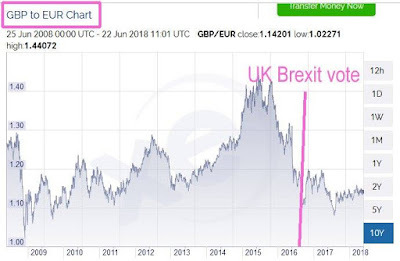 Here is a chart for GBP to USD. 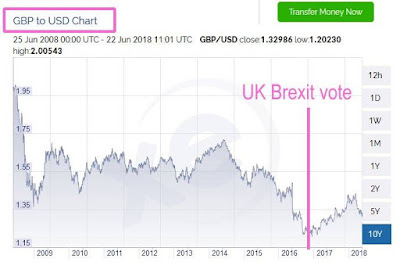 Conversion rates started falling in the run up and discussion of the Brexit vote, and plummeted at the point when the flawed UK Brexit vote was taken. There has been a slight increase since, but nowhere near the highs prior to all this. 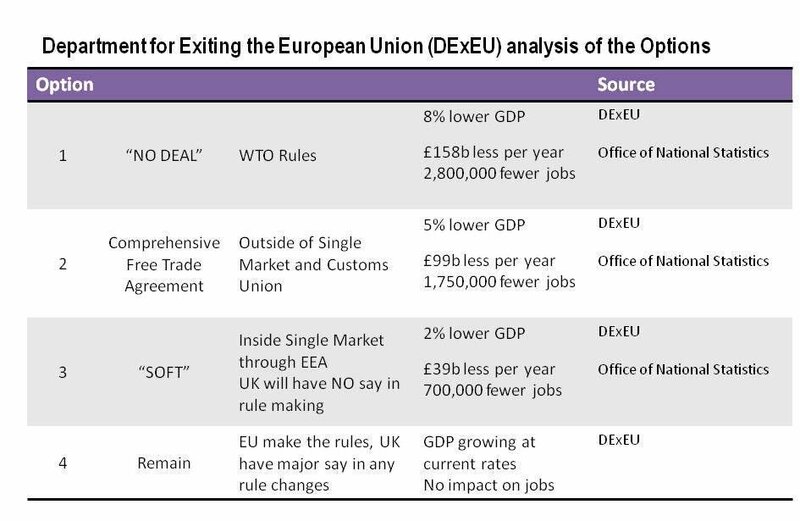 So we will see the fortunes of most people in the UK, including authors, suffer if Brexit goes ahead, exacerbated by the increased costs for items (so a relative drop in spending power). Funnily enough, independent authors may fare best - those that are paid in USD would then be paid in a currency that has gone from a poor second cousin to Sterling, to becoming equal, and soon to surpass it. So if the APWG really want to help authors, they would do all they could to stop Brexit occurring. There are increasing calls to stop it from all sides of the political spectrum. I'm not a fan of Public Lending Right (PLR). For most authors it leads to no significant increase in income (or any at all), yet it adds to their admin burden and requires money being set aside from public funds, and staff to administrate it, systems set up, national sampling and so on. Those who sell most books, so already have a good income, tend to get the largest payouts; those who sell the fewest books, and have the smallest income, tend to gain little or nothing from PLR. If we set aside funds and set up piecemeal systems and organisations for every industry where people struggle (which is probably just about every industry anyway) then you just end up with a big wasteful mess of bureaucracy. It's neither efficient, elegant, not practical - these kind of systems can only exist at all by limiting it to a few industries, which then excludes lots of other people. And things have changed. There is no shortage of authors - the number grows every day. But there is a shortage of libraries as they close or get cut back due to lack of funding, and Councils see them as low priority, soft targets for budget cuts. If this continues then PLR will be for nothing, because there won't be libraries left to loan books. Along with the cuts to libraries we are seeing increased calls from the private sector to do away with them and to replace them with bookshops that benefit ... the private sector. It's similar to the position in Wales. Bodies like the Welsh Books Council and Literature Wales have many more staff trying to sell and promote (often unwanted) books than there are dedicated specialist library advisors in the Welsh Government (even though the latter are responsible for vital public library provision). No wonder libraries are struggling. Personally, I'd do away with PLR and assign the money (and more) as a ringfenced sum to keep public libraries going instead, so that everyone can benefit. We all love libraries. Libraries make a huge contribution to the economy and education. You'll find more facts here. Yet Government expenditure on libraries is dropping, and libraries everywhere are closing (see this partial list of UK groups set up to try and save some of their libraries). I do provide an alternative to PLR below. In many ways it is silly to support individual industries at the expense of others. But our current system is that every profession campaigns separately for more money for their members. Some win, some lose. Those that lose fall behind comparatively too. So you end up with all this effort across every sector, each one campaigning for more money. These issues to do with author incomes are no different. And setting up piecemeal interventions for each industry is costly, complicated, and unfair. This is probably why there has been an increased awareness of the possibilities of Universal Basic Income in recent years. It would provide a solution to this and many other issues. It would provide a guaranteed income to authors so they could afford to write, but also a guaranteed income to everyone, freeing up time to volunteer, to become carers for friends or family, to contribute to the community, to pursue any creative endeavours, to study. With Universal Basic Income there would be no need for benefits, PLR, child support - all of those could be replaced. Disparities in income would be lessened. With UBI authors would be even better off than they would have been with PLR, but so would everyone else in the UK. And this system treats everyone equally, in every industry, every creative profession. With political will from all the parties this is achievable. Rather than expand on this myself, here are links to further information. Is 2017 the year of the universal basic income? Too many books are published, so income reduces. If most people knitted items for sale then the price for knitted items would go down, and income for knitters would drop too. Paying money to knitters would only make things worse, by encouraging more people to carry on knitting, so the price drops even more. Trying to interfere will just make it worse, and be fiddling with one profession out of hundreds - why should knitters get more help than sewers, weavers, carpenters, musicians and so on? We can't approach it piecemeal. This means a slightly lower average income for some authors is not a problem, it is just an inevitable result. Cease Brexit. This will stop things getting worse for everyone in the UK. Consider a Universal Basic Income via cross-party support. Then there's no need for benefits, PLR etc - all are replaced, and everyone is better off. Author incomes would increase enough that the previous drops for some authors become irrelevant, since all authors would get a higher income. I submitted a truncated version of this post to the APWG on 2018-07-27.